Taoiseach Enda Kenny and Finance Minister Michael Noonan were forced to intervene in a bid to defuse a Cabinet row over Ireland's UN voting record. 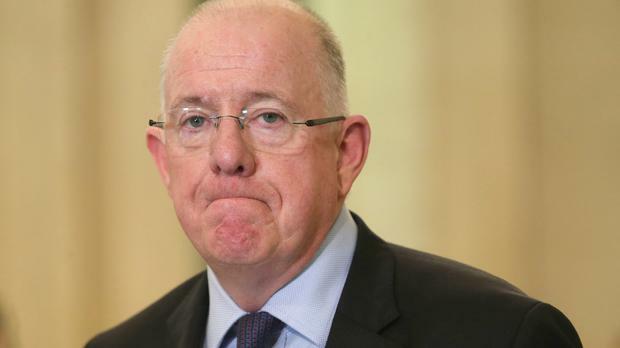 Foreign Affairs Minister Charlie Flanagan has again refused to outline whether Ireland voted in favour of Saudi Arabia joining the UN Commission on the Status of Women. The Government has to date refused to disclose how it voted, stating that doing so would damage Ireland's international diplomatic relationships. Privately, several ministers said they believe Ireland did vote in favour. Yesterday, tensions surfaced between Fine Gael and the Independent Alliance. The issue was the subject of testy exchanges between Mr Flanagan and Independent Alliance ministers Finian McGrath and Shane Ross. During the meeting, Mr McGrath is understood to have said members of the public have a right to know how Ireland voted on this issue, given Saudi Arabia's record on women's rights. He likened the refusal to disclose Ireland's voting record to the "days of walls of silence". The Dublin North Central TD said it was clear from the Government's response to the controversy that Ireland voted in favour of Saudi Arabia's membership. However, Mr Flanagan, who received support from his Fine Gael colleagues, refused to confirm whether this was in fact the case. Following interventions by Mr Kenny and Mr Noonan, a compromise was struck. It was agreed that in future, all major "red flags" will be highlighted in advance at Cabinet meetings. "We weren't prepared to bring down the Government over this but we certainly aren't satisfied over Mr Flanagan's refusal to disclose how we voted," said an Independent Alliance source. Last night, a spokesman for the Taoiseach said what way Ireland votes in the future will remain confidential. Despite this, a spokeswoman for Independent ministers said Mr Flanagan's commitment is a "significant step forward". She said that the Independent Alliance believes it has moved the issue forward and achieved a compromise as this agreement wasn't previously in place. The issue of how Ireland voted was also raised during a Dáil debate yesterday. Mr Kenny suggested that the compromise struck with the Independent Alliance was satisfactory to all sides. "For those who wish that there would be a big row about this inside Cabinet, let me say that the members of the Independent Alliance were quite happy to say we need to have the opportunity to ask relevant questions and be better informed about votes that are coming up at the United Nations by the Foreign Affairs and Trade Minister, and that is the case," Mr Kenny told the Dáil. Last week, Mr Kenny was forced to admit that he did not raise the issue of women's rights during a trade mission to Saudi Arabia in 2014. He said he instead raised the issue of "human rights" and that women's rights have been raised in other forums.